Since I've clearly missed my original deadline by, well, a lot, I've decided the best course of action is to continue working on collection pieces and post them up in my (still a WIP) shop on a made-to-order basis. That way I can add things when they are done instead of waiting until x number of copies are done. Which, thinking about it now, is really how I should have done it in the first place. Oh well. We'll see what happens. Tan fuzzy shorts for MNF, lined in white cotton. I don't know if they will work for Bisou Ai, since the fabric is a bit thick, but we'll see. 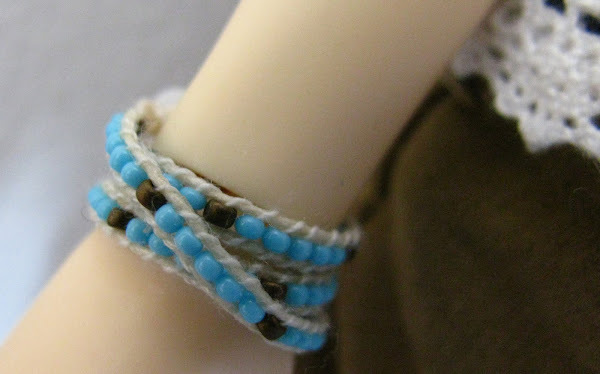 I think these bracelets are my favourite things I've ever made. They're fun to make, relatively painless and look excellent (if I do say so myself. :P). I tried making similar ones for myself... but they don't look quite as nice. Almost all of these are prototypes and will have minute differences in the final versions, but since they're mostly changes like '-2mm on this strap', 'tie the knot this way instead' I'm assuming it won't be very apparent.